Do you remember beanbag chairs? When I was a kid, it seemed like every home had one. They were so comfortable for reading, watching television and playing video games on the old Atari system. A couple of years ago, I noticed our youngest liked to sit on a pile of throw pillows on the floor. 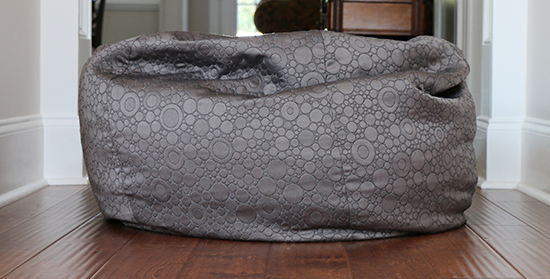 It seemed like the perfect time to make a beanbag chair. I started with a Simplicity Home Decorating pattern: #5105 Simply Teen Easy Pillows, view B. Next, I selected a heavy upholstery fabric in a dark color — I wanted this beanbag to be able to withstand any and all abuse. Finally, I picked out a zipper, some muslin and beanbag filling. If I had followed the pattern directions, I would have ended up with a beanbag chair made from a single layer of completely sewn together fabric. I’ve been a parent long enough to know that spills and illnesses happen, so I changed that a bit. I made an outer layer with the upholstery fabric and added a zipper to the bottom panel, then made an inner layer from muslin that was sewn shut after being filled. By doing that, I could remove the outer layer for washing as needed. Something I hadn’t considered was the filling losing its puffiness. I seem to remember the filling far outlasting the fake leather on those old beanbag chairs. Yet here we are, just a couple of years later, with a deflated one. I decided that if I was going to remove the seam on the bottom panel of the muslin layer, I was going to add a zipper while I was at it. As I considered my options, it seemed the best solution was to hand stitch the zipper into place. I didn’t want to deal with removing and returning the filling, nor did I want to wrestle a half full beanbag through my sewing machine. Hand stitching the zipper in place ended up being much easier than I expected. For extra stability, I sewed two rows of stitches on each side of the zipper. Refilling the beanbag also turned out to be much easier than I expected. The first time around, we lived in a dry climate and it took hours to get the filling into the beanbag. Errant bits of filling were stuck on just about every surface; it was not a positive experience. This time, in a humid area, the filling poured right in within minutes. The beanbag chair is getting a lot of use again. It could maybe use another half bag of filling, but I don’t want to store the other half so I’m going to give it a little time to compress again. 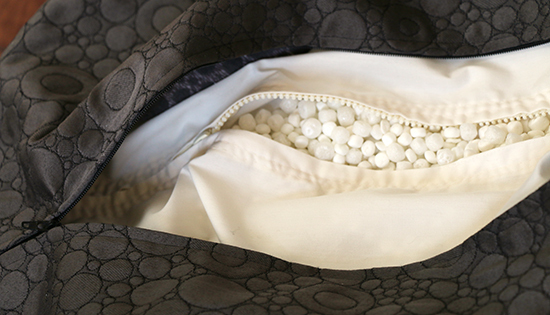 What sort of filling do you prefer for beanbag chairs, and where do you find it?